The night before Paul left for a business trip to Shanghai, our condo looked like a battleground of laundry, shoes, shirts and matching ties, stacks of books and papers, and one big blue suitcase. 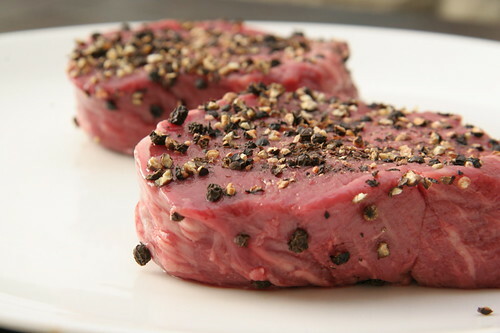 Amid the chaos, I was in the kitchen, pressing crushed peppercorns into two filet mignons. Erich Fromm, in the “Art of Loving,” says that separation is the root of all anxiety. That’s certainly true for us. Whenever Paul leaves, I’m giddy for a total of about three seconds, and then panicky, and finally just dazed until he comes home. Ah, yes, the Valentine’s Day steak au poivre. That was something. Valentine’s fell on a Thursday this year and I had no intention of spending hours in the kitchen after a long workday. I wanted something romantic and special but quick. I looked up “steak au poivre” on the Internet and found a Gourmet magazine recipe originally published in 1955. The ingredients for the sauce were simple: butter, cognac, cream, and shallots. Sometimes the most simple recipes are the best. My husband, a self-proclaimed Francophile, said it was the best steak au poivre he’d ever had. Of course, he tells me just about every dish is the best he's ever had. But this time, I saw the face of a man who had just been jettisoned to his favorite country and was soaking up the romanticism he felt for it all over again. Though he bought me a card and a beautiful pair of earrings that night, that single expression of joy and pleasure was the best gift I could have gotten. So this week, in between loads of laundry, I recreated the dish and served it with creamy whipped mashed potatoes and a 2005 Bordeaux. As he sliced through the medium-rare filet mignon and took the first bite, he closed his eyes for a brief moment then smiled, giving me the gift of his joy all over again. Heat a 12-inch heavy skillet (preferably cast-iron) over moderately high heat until hot, about 3 minutes, then add oil, swirling skillet, and sauté steaks in 2 batches, turning over once, about 6 minutes per batch for medium-rare. Pour off fat from skillet, then add shallots and half of butter (2 tablespoons) to skillet and cook over moderately low heat, stirring and scraping up brown bits, until shallots are well-browned all over, 3 to 5 minutes. Add Cognac (use caution; it may ignite) and boil, stirring, until liquid is reduced to a glaze, 2 to 3 minutes. Add cream and any meat juices accumulated on platter and boil sauce, stirring occasionally, until reduced by half, 3 to 5 minutes. Add remaining 2 tablespoons butter and cook over low heat, swirling skillet, until butter is incorporated. Serve sauce with steaks. *Note: The sauce is enough for four steaks if you want to cook this for guests. I like having a little extra to pour over mashed potatoes. Angela, that steak will definitely make him homesick...I wouldn't want to leave. Great job on the steak. Thanks, Peter! Seriously, this dish is so deeply satisfying and romantic. You can't get much better! Thanks, Nina! It's so true -- the kitchen can be such a sanctuary from the chaos of our lives. I can't believe my hubby is leaving again tonight -- this time to Montreal! I've got a wonderful French country chicken dish planned. Hmmmm, can't wait to dig in!